Back in the beginning of March, the Golden State Warriors suffered their worst home loss of the Steve Kerr era, falling by 33 points to the Boston Celtics. 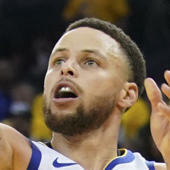 That mark ended up lasting just a few weeks, as the Dallas Mavericks waltzed into Oracle Arena on Saturday night and took down the Warriors, 126-91, handing them a 35-point home loss -- a new worst mark at home under Kerr. Leading the way for the Mavericks was their brilliant rookie Luka Doncic. The youngster recorded yet another triple-double, finishing with 23 points, 11 rebounds and 10 assists. Doncic is now fourth all-time as a rookie with six triple-doubles this season. He did it in style as well, hitting some nasty step-back 3s, and finishing a circus and-one bucket that still doesn't really make sense. Additionally, in what will likely be his final game in Oracle Arena, Dirk Nowitzki put up his highest scoring game of the season, finishing with 21 points and five rebounds. It should, of course, be noted that the Warriors were playing without Steph Curry in this game, but even still they shouldn't be losing to a tanking Mavericks team by 35 points. Especially with the likes of Klay Thompson, Kevin Durant, Draymond Green and DeMarcus Cousins still in the starting lineup. Looking disinterested in regular season games in March and April -- even earlier, at times -- has been part of the Warriors' style throughout their run, but it's been happening more often this season. It likely won't matter much come playoff time, but it has been an interesting trend to watch.